Investigations into a bomb blast that missed President Emmerson Mnangagwa by a whisker nearly six months ago do not seem to be heading anywhere, with the probe team still to apprehend suspects linked to the heinous act. Insiders close to the investigations say there were no useful leads as yet on the person or persons who planted the explosives that detonated at a Zanu-PF rally addressed by Mnangagwa in June. Initially, police had zeroed in on two suspects - Douglas Musekiwa and John Zulu - whose ages were not given but were later released following an order from the High Court. As the incident which has already created friction in Mnangagwa's administration develops into another cold case, speculation is that it was an inside job. Divisions and factionalism have intensified in the ruling Zanu-PF party ever since former president Robert Mugabe's ouster in November last year. While questions on what exactly transpired in the second city on that otherwise fine afternoon still ramble in many people's minds, government insists it will nab the suspects and ensure they have their day in court. Mnangagwa's spokesperson George Charamba told the Daily News on Sunday that investigations are still underway, claiming they were at a very delicate stage. He said: "I have just been in touch with the military intelligence, police and Central Intelligence Organisation. Investigations are now at a delicate stage, so we cannot reveal any information, but you will be exclusively informed as information comes in". Stadium in Bulawayo - escorted by secret service agents - when shots were fired and there was a blast near him, adjacent to the front of the stage. The blast went off moments after he had stepped off the stage accompanied by his deputies, Constantino Chiwenga and Kembo Mohadi, along with other party officials. 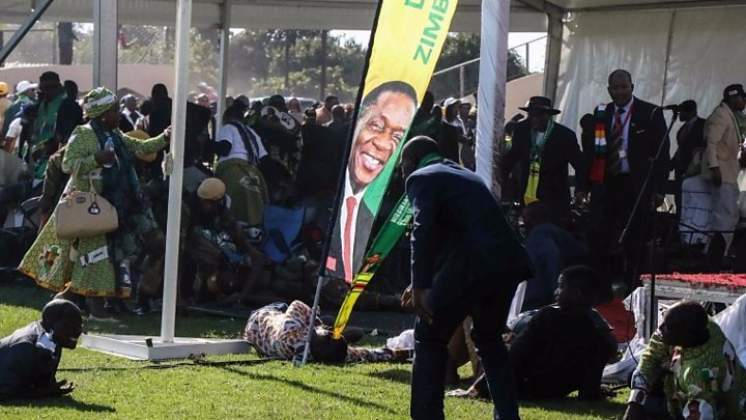 As Mnangagwa, Chiwenga, Mohadi and other officials made their way off to waiting vehicles, the blast blew off the steps, sending fragments that injured several aides, Zanu-PF officials and supporters. Two security aides have since died from the injuries sustained from the attack, which Mnangagwa initially blamed on the vanquished Generation 40 faction that was involved in a war of attrition with him in the ruling party's deadly succession and tribal wars. Mnangagwa has told his Zanu-PF parliamentary caucus that the people behind the Bulawayo bombing which killed two people were now known and will be dealt with. "We want to thank God (for intervening) on what happened in Bulawayo," Mnangagwa said. "We now have the knowledge on who did it." But there is still no publicly available information on the whodunit. Former War Veterans minister and ex-army colonel Tshinga Dube has previously opined that those behind the June 24 attack may have used a landmine to carry out their heinous act, instead of a grenade, as is being widely speculated. Dube - a weapons expert who once worked for the Zimbabwe Defence Industries (ZDI) as its principal officer - was left nursing a slight knee injury following the shock bomb explosion. ZDI used to manufacture mortar rounds, land mines, and light armoured fighting vehicles. Dewa Mavhinga, a human rights activist and analyst, said the blast may have been a direct consequence of bringing the military into close proximity to civilian authority in November last year. He said Zimbabwe generally has a crude law on weaponry possession which makes it difficult for civilians to acquire explosives, suggesting it could have been an inside job. "The military coup of November 2017 directly brought in the military into partisan national politics together with a high risk of destabilisation of the government and the ruling party Zanu-PF," Mavhinga said. "The Bulawayo bombing may very well have been a direct consequence of bringing the military into close proximity to civilian authority, and as such, any investigations into how the bombing was organized and carried out, is bound to be highly sensitive. It is also highly likely that the bombing was carried out by a person or people with close proximity to the Zanu-PF leadership, and with access to explosives, who could also gain access to the VIP tents. "All these factors point to an inside job, or close collaboration with insiders," Mavhinga said. Political analyst Maxwell Saungweme said the incident looked intramural than external. "People know who has access to the type of ordnance used in the unfortunate bombing incident. By the way, our intelligence and spy agency is one of the best in the region. I am sure they know exactly who was behind this. Keeping it on wraps can only be affirmation that this was an internal job and letting the cat out of the bag is poor political strategy. Expect nothing unguarded to come out of this. At best, you might have some unfortunate paid bloke being paraded as the bomber. But the truth will unlikely surface in such delicate cases," said Saungweme. In 1962 former Zapu vice president Tichafa Parirenyatwa died when his car was rammed by a train. His driver survived the accident and they are different accounts of what really happened. *In March 1975 Zanu-PF chairperson Hebert Chitepo was killed by a car bomb in Lusaka Zambia. Although former Zambian president Kenneth Kaunda launched an inquiry and arrested several Zanla officials including Josiah Magama Tongogara no conclusion was made and Chitepo's death remains a mystery unto this day. *In 1979 on the eve of the country's independence Tongogara himself died in a car accident that remains a puzzle to this day due to conflicting reports. Tongogara wanted Zapu and Zanu to contest the 1980 as one party something that was opposed by former president Robert Mugabe and his allies. *Former minister of Industry and Commerce Chris Ushewokunze also died in mysterious circumstances at Suri Suri in 1994. Apparently he had clashed with Mugabe on economic policies. *In the 1990s, long before Zanu-PF factionalism became explosive, a rising star in the form of Zororo Duri, a technocrat in government died in an accident along Harare-Mutare road in 1996. Duri had against advice from Zanu-PF heavyweights contested and won against the now late Kumbirai Kangai. *Also in 2001 another Zanu-PF rising star and political commissar Border Gezi was killed when his car veered off the road after a tyre problem along the Harare-Masvingo road. The combative Gezi had raffled a few feathers among the party honchos. *In 2007 when the country was going through perhaps its worst economic patch Paul Armstrong Gunda, a brigadier general and hero of the liberation war met his fate after his car allegedly rammed into a train along the Harare-Mutare road. An inquiry into his death said they was no foul play even as his wife raised suspicion. *A year later in 2008 another former political commissar Eliot Manyika was killed in a road accident along the Zvishavane-Mbalabala road. He was on a mission to restructure Zanu-PF structures when he died. An inquest into his death ruled out any foul play. *Fast forward to 2011, Solomon Mujuru, whose nome de guerre was Rex Nhongo perished in an inferno that reduced his body to ashes. His wife and former vice president Joice Mujuru has said that he was murdered even as a government sponsored inquest ruled out any foul play.